UK companies can change their name at any point during the life of the company. As long as the name is available you can change your company name. We can assist you in changing your company’s name at Companies House. On instruction we will check the availability and where necessary provide advice on any similarities that may prevent the new name from being registered. 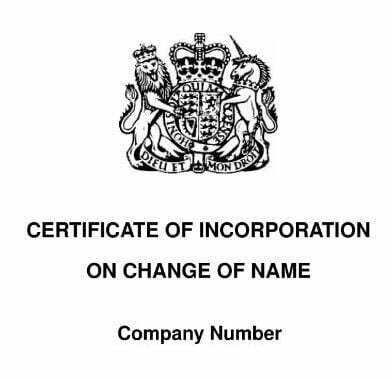 We will then file the correct forms at Companies House electronically and email you a copy of the name change certificate on completion. If we cannot complete the process electronically then we can also produce the paperwork for the company shareholders to sign. The manual name change application can then be filed by post. Why do companies change names? They may have purchased a readymade company and would prefer a more suitable name. There may have been an error at the time of incorporation. It is unfortunate but we see several company names registered every year with typos. Some customers prefer their company name to have Limited (in full), Ltd (abbreviated) Ltd. (abbreviated and punctuated) and in the case of not for profit companies they may remove the word limited from their company name under section 60 of The Companies Act 2006. Companies may find that their field of expertise changes over the years. Consider the Carphone Warehouse. It is unlikely that they sell any phones that are solely for use in cars. They may at some point choose to re-brand the company and may change the company’s registered name. We see many businesses change their incorporated name because it no longer portrays the right image. The business may be sold to new owners that would prefer a new company name. Company mergers and acquisitions often result in a name changes being required.